Summer league registration is now open. This will be a 12 week session beginning the week of May 13. Several leagues are offered for morning, noon, and night. Please indicate all alternate leagues you could play, in the event your preferred league does not receive enough participation. Register at: Racquetball Summer League Registration. Registration is now open for a 1-day, open-to-the-public tournament held Saturday, April 27. Lunch will be provided, and fruit & drink will be served all day. Low entry fees and cash prizes for the top finishers! More info and online registration may be found at: Racquetball Tournament Registration. posted: April 1, 2019 by: Tim Registration opened Monday, April 1. Will close on Tuesday April 30. Play begins on Monday May 6. Competitive league will play on Monday nights and recreational league will play on Tuesday nights. Cost for the league will be $100.00 per team. 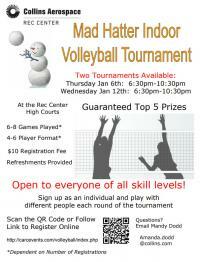 posted: March 31, 2019 by: Mandy Join us for a festive Cinco de Mayo, Mad Hatter Indoor Volleyball Tournament at the Rec Center. posted: August 29, 2018 by: Don Wright Ping Pong Registration is Open. Click HERE to Fill-in a Registration Form and pay the fee on-line. You may signup anytime throughout the season and come out and play. League play begins on Friday 10/5/18 at 5:30pm. posted: August 21, 2018 by: Casey Kohl Futsal sessions are on Saturday’s from 10 a.m. - Noon and on Tuesday’s from 8 - 10 p.m. Registration for the Winter 2019 Season is FULL. The first Saturday session will be on October 27th and the first Tuesday session will be on October 30th. NEWS: its a new year, time to get shooting those clay pigeons. Spring League - individual competition starts April 9th and ends May 19th. $5.00 entry fee. 2019 Summer League 5-8 person teams. Team Captain’s Meeting @ Otter Creek Sportsman’s Club on 7 May 2019. Summer League starts May 21st and runs through Sep 8th. Put your team together and join us from some fun shooting!! See the website sight or call Jim Russo or Amanda Mattox for more info. Team and Player Registration is OPEN for the Winter 2019 Season. Games will begin Wednesday, TBD and Thursday, TBD. The final sessions will be on Tuesday April 23rd and Saturday April 27th. SATURDAY IS FULL. THERE ARE STILL SPOTS AVAILABLE ON TUESDAY NIGHTS. posted: August 29, 2018 by: Don Wright • Registration is Open. posted: August 27, 2018 by: Jeff Havel Registration is CLOSED for this season’s Collins Rec. Center Co-Ed Interdepartmental Kickball Tournament. Team Registration will be OPEN from September 3rd ’til October 12th. Season will run from October 22nd to March 26th. Games will be played on Mondays and Tuesdays. posted: May 1, 2017 by: Rob Nolting Soccer Team and Player Registration is OPEN for the upcoming Summer Season.